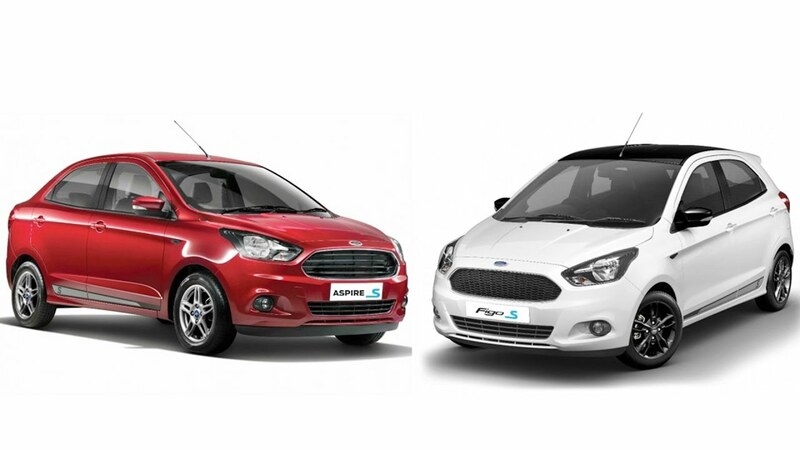 Ford has launched new ‘Sport Edition’ of the Figo and Aspire models – christened Figo S and Aspire S – that come along with a dozen changes to make these cars look sportier than before. Available only in the ‘Titanium’ trim, the Figo Sports Edition is priced at Rs.7.21 lakhs for the diesel variant and Rs.6.32 lakhs for the petrol variant. The Ford Aspire in Sports Edition is priced at Rs.7.60 lakhs for the diesel variant and Rs.6.51 lakhs for the petrol variant. Exterior changes on the Figo S include new wider 15-inch blacked out alloy wheels, smoked headlamps, blacked-out honeycomb grille, decals and a blacked out roof giving the cars a sporty stance thanks to the dual tone paint job and the new spoiler on the back. The Aspire S receives similar updates but carries the same grille as the current generation Aspire and the new 15-inch alloy wheels are not blacked out. It misses out on the addition of a spoiler. The interiors on both these models have been given an all-black treatment and come with contrast stitching. In terms of mechanical updates, the Figo S and Aspire S get stiffer suspension setup. Both of these models are powered by the same 1.5-litre four-cylinder diesel engine that delivers 100 hp and 215 Nm of torque and the 1.2-litre petrol engine that produces 88 hp and 112 Nm of torque. The ‘S’ variants will only be available with a 5-speed manual transmission setup.